Can I get heated seats? Do I have to get a sunroof? 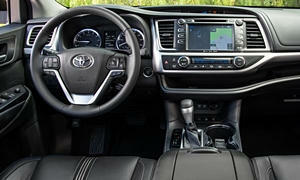 Find out what you need to know about Toyota features right here. AC power outletPowers devices with a regular home electrical outlet. Limited wattage: forget about using it to power a blow drier. Powers devices with a regular home electrical outlet. Limited wattage: forget about using it to power a blow drier. Adaptive cruise controlAutomatically maintains set distance behind preceding vehicle as well as set speed. Minimum speed around 30 mph. Replaces regular cruise control, and includes its value. Automatically maintains set distance behind preceding vehicle as well as set speed. Minimum speed around 30 mph. Replaces regular cruise control, and includes its value. Power front side windowsOften must be ordered with power rear side windows, if these are available. Often must be ordered with power rear side windows, if these are available. Power liftgateLiftgate can be opened and closed using buttons inside the vehicle and on the keyfob. Liftgate can be opened and closed using buttons inside the vehicle and on the keyfob. Power trunk / liftgate pull-downPulls decklid / liftgate tight after latch is engaged. Door can be shut with very little effort. Pulls decklid / liftgate tight after latch is engaged. Door can be shut with very little effort. Proximity keyEnter and start the vehicle without removing the key from your pocket. Enter and start the vehicle without removing the key from your pocket. Remote keyless entryUnlock and lock the car using buttons on the keyfob. Unlock and lock the car using buttons on the keyfob. Remote startStart the car using a button on the keyfob. Interior can be a comfortable temperature as soon as you get in. Start the car using a button on the keyfob. Interior can be a comfortable temperature as soon as you get in. Sunshades, second rowGreatly reduce the amount of sunlight entering the rear side windows. Retract into rear doors. Greatly reduce the amount of sunlight entering the rear side windows. Retract into rear doors. 4-wheel disc brakesRear disc brakes. Active or whiplash-reducing head restraints, front seatsIf active, automatically move forward when the vehicle is rear-ended. Note: becoming less common. If active, automatically move forward when the vehicle is rear-ended. Note: becoming less common. AlarmOnly listed when pricing a single model because insufficient data for all cars. Only listed when pricing a single model because insufficient data for all cars. Antilock brakes (ABS)Automatically pulse the brakes in hard stops to prevent wheels from locking up, making it possible to brake and steer at the same time. Automatically pulse the brakes in hard stops to prevent wheels from locking up, making it possible to brake and steer at the same time. Around view camerasSmall external cameras provide a top-down view all around the vehicle, to reduce blind spots while parking. Small external cameras provide a top-down view all around the vehicle, to reduce blind spots while parking. Automatic braking, high-speed or partialIf collision detection system senses imminent collision, applies moderate braking. If collision detection system senses imminent collision, applies moderate braking. Automatic braking, low-speedAutomatically brakes car to avoid low-speed collisions. Automatically brakes car to avoid low-speed collisions. Blind spot warning systemMirror-mounted lights indicate when another vehicle is in a blind spot. Mirror-mounted lights indicate when another vehicle is in a blind spot. Brake assistWhen a panic stop is sensed, fully applies the brakes. When a panic stop is sensed, fully applies the brakes. Cross-traffic warning, rearWarns of traffic coming from either direction when vehicle is in reverse, to prevent accidents when backing out of parking spaces. Warns of traffic coming from either direction when vehicle is in reverse, to prevent accidents when backing out of parking spaces. Daytime running lights (optional)Only listed if not standard on all trims. No value because no way to compare across models. Only listed if not standard on all trims. No value because no way to compare across models. Forward collision warningAlerts driver when approaching the preceding car too quickly. Alerts driver when approaching the preceding car too quickly. Front airbagsMandatory, in all cars. Hill descent controlSelectively applies the brakes to maintain a slow, steady descent on off-road downhill slopes. Selectively applies the brakes to maintain a slow, steady descent on off-road downhill slopes. Hill start assistApplies the brakes to hold the vehicle in place on an incline. Incomplete data, so only displayed when pricing a single vehicle. Applies the brakes to hold the vehicle in place on an incline. Incomplete data, so only displayed when pricing a single vehicle. Lane departure prevention, steering-basedSteering lightly applied to help prevent the vehicle from inadvertently traveling out of its intended lane. Steering lightly applied to help prevent the vehicle from inadvertently traveling out of its intended lane. Lane departure warningAlerts driver when the vehicle seems to be wandering out of the lane. Alerts driver when the vehicle seems to be wandering out of the lane. Obstacle detection, frontBeeps signal distance to object in front of vehicle. Parking aid. Beeps signal distance to object in front of vehicle. Parking aid. Obstacle detection, rearBeeps signal distance to object behind vehicle. Parking aid. Beeps signal distance to object behind vehicle. Parking aid. Pedestrian detectionWarns driver of pedestrians in path of car. Warns driver of pedestrians in path of car. Perimeter scanCameras pan all the way around the vehicle to help check for nearby objects. Can be paused. Cameras pan all the way around the vehicle to help check for nearby objects. Can be paused. Radar- or camera-based collision preparation systemPrepares brakes (and sometimes also seat belts) for use when radar detects an imminent collision. Might also move seats and close windows. Early Lexus system used laser. Prepares brakes (and sometimes also seat belts) for use when radar detects an imminent collision. Might also move seats and close windows. Early Lexus system used laser. Rearview cameraRearview camera connected to display screen on the instrument panel. Often requires navigation system. Rearview camera connected to display screen on the instrument panel. Often requires navigation system. Rollover sensorDeploys extended duration side curtain airbags when the vehicle rolls over. Usually included on tall vehicles. Rare on others. Deploys extended duration side curtain airbags when the vehicle rolls over. Usually included on tall vehicles. Rare on others. Seat cushion airbag, passengerAirbag inflates under leading edge of seat cushion to prevent the passenger from sliding forward. Airbag inflates under leading edge of seat cushion to prevent the passenger from sliding forward. Side curtain airbags, three rowsAirbags contained just above the window level. Cover all three rows. Airbags contained just above the window level. Cover all three rows. Stability controlSelectively applies the brakes to prevent excessive understeer or oversteer (spinning). Selectively applies the brakes to prevent excessive understeer or oversteer (spinning). Tire-pressure monitorTwo types: a warning light when a tire is low on air and a pressure readout for each tire. Two types: a warning light when a tire is low on air and a pressure readout for each tire. Traction controlWhen a drive wheel slips, it is braked and/or engine power is reduced, restoring traction. When a drive wheel slips, it is braked and/or engine power is reduced, restoring traction. Class II trailer hitchHitch rated for up to 3,500 pounds. Capacity of the vehicle could be lower. Hitch rated for up to 3,500 pounds. Capacity of the vehicle could be lower. Liftglass or two-piece tailgateDo not have to open entire tailgate to access the cargo area. Do not have to open entire tailgate to access the cargo area. Overhead sunglass holderUsually part of an overhead console. Usually part of an overhead console. Storage beneath cargo floorLarge storage area beneath the load floor, often compartmentalized. Large storage area beneath the load floor, often compartmentalized. Trailering equipment (4 wire)Includes four-wire harness, limited to relatively small trailers. Includes four-wire harness, limited to relatively small trailers. A/V input jacksJacks for a video camera, game console, or other device with A/V output. Jacks for a video camera, game console, or other device with A/V output. App supportTouchscreen and/or voice control over apps that can include online search, Facebook, Twitter, Pandora, OpenTable, and MovieTickets.com. Requires connected compatible phone. Fees may apply after first three years. Touchscreen and/or voice control over apps that can include online search, Facebook, Twitter, Pandora, OpenTable, and MovieTickets.com. Requires connected compatible phone. Fees may apply after first three years. Automatic climate control, frontMaintains set temperature in front row. Requires air conditioning and does not include its value. Maintains set temperature in front row. Requires air conditioning and does not include its value. Aux inputJack for an iPod or similar device. No value because of incomplete data. Will soon be standard on nearly every car. Jack for an iPod or similar device. No value because of incomplete data. Will soon be standard on nearly every car. Blu-Ray-compatible entertainment systemEntertainment system able to play Blu-Ray discs. Entertainment system able to play Blu-Ray discs. Bluetooth audio streamingUses Bluetooth rather than a cable to integrate audio device. Requires compatible audio device and/or phone. Uses Bluetooth rather than a cable to integrate audio device. Requires compatible audio device and/or phone. Bluetooth cell phone linkEnables hands-free communication by wirelessly connecting a cell phone to a microphone and the vehicle's stereo speakers. Enables hands-free communication by wirelessly connecting a cell phone to a microphone and the vehicle's stereo speakers. Dual-zone climate controlTemperature can be separately set for left and right sides of the passenger compartment. Requires air conditioning and does not include its value. Temperature can be separately set for left and right sides of the passenger compartment. Requires air conditioning and does not include its value. DVD-compatible playerAudio system capable of playing DVDs on a front-row screen. Inoperative when the vehicle is moving. No value because of incomplete data. Audio system capable of playing DVDs on a front-row screen. Inoperative when the vehicle is moving. No value because of incomplete data. Entertainment system, ceiling-mountedA DVD player and ceiling-mounted screen. Often includes a pair of wireless headphones. A DVD player and ceiling-mounted screen. Often includes a pair of wireless headphones. HD radioHigh-definition radio, which broadcasts a digital signal. Free, no subscription fees. High-definition radio, which broadcasts a digital signal. Free, no subscription fees. IntercomDriver can speak through microphone to the rear speakers. Driver can speak through microphone to the rear speakers. Interior air filterFilters exterior air before it enters the passenger compartment. No default value because most cars have them, even in cases where they're not in the official list of features. Filters exterior air before it enters the passenger compartment. No default value because most cars have them, even in cases where they're not in the official list of features. MP3-compatible playerAudio system capable of playing discs with MP3 files. Audio system capable of playing discs with MP3 files. Navigation appCan display navigation from a free phone-based app on a built-in screen. Won't operate in areas with a poor data signal. Uses data on your phone's plan. Can display navigation from a free phone-based app on a built-in screen. Won't operate in areas with a poor data signal. Uses data on your phone's plan. Rain-sensing wipersWipers automatically turn on and adjust their speed based on input from a rain sensor. Wipers automatically turn on and adjust their speed based on input from a rain sensor. Rear air vents with automatic controlsMaintains set temperature in rear passenger area by providing heated or cooled air through vents in the center console, B-pillars, and/or ceiling. Replaces and includes value of rear air vents with manual controls. Maintains set temperature in rear passenger area by providing heated or cooled air through vents in the center console, B-pillars, and/or ceiling. Replaces and includes value of rear air vents with manual controls. Rear air vents with manual controlsFan speed and/or temperature can be manually set for vents in the center console, B-pillars, and/or ceiling. Includes value of rear vents. Fan speed and/or temperature can be manually set for vents in the center console, B-pillars, and/or ceiling. Includes value of rear vents. Rear heat ductsDucts under front seats direct heated air to the second row. Ducts under front seats direct heated air to the second row. Rear HVAC unitA second evaporator provides cool air to rear vents. Does not include the value of these vents. Includes rear heater. A second evaporator provides cool air to rear vents. Does not include the value of these vents. Includes rear heater. Satellite radioXM or Sirius. Includes a subscription for three to six months, after which monthly fees apply. XM or Sirius. Includes a subscription for three to six months, after which monthly fees apply. Siri Eyes Free supportActivate Siri using button on steering wheel. Make calls, hear and dictate texts and email, manage calendar, turn-by-turn nav. Requires iPhone 4S or higher. Activate Siri using button on steering wheel. Make calls, hear and dictate texts and email, manage calendar, turn-by-turn nav. Requires iPhone 4S or higher. SMS text-to-speech readerConverts text messages to speech. Converts text messages to speech. Telematics service, such as OnStarIn-vehicle security, communications, and diagnostics system. For 2011 and newer cars often includes a remote app. Monthly fee after the first 6-12 months. In-vehicle security, communications, and diagnostics system. For 2011 and newer cars often includes a remote app. Monthly fee after the first 6-12 months. Traffic + travel informationInformation about traffic plus weather, gas prices, sports news, and/or movie times. Monthly fee after first 3-12 months. Information about traffic plus weather, gas prices, sports news, and/or movie times. Monthly fee after first 3-12 months. USB portOften permits an iPod or phone to be integrated into the vehicle's entertainment system and controls. Often permits an iPod or phone to be integrated into the vehicle's entertainment system and controls. Variable intermittent wipersTime between wipes can be precisely adjusted. Time between wipes can be precisely adjusted. Voice control for audio systemSometimes also includes voice control over climate control system. Sometimes also includes voice control over climate control system. Voice control for nav and audioSometimes also includes voice control over climate control system. Wiper de-icerHeating elements defrost area where front wipers rest. Heating elements defrost area where front wipers rest. Bodyside claddingProtective cladding extending partly onto the doors. Protective cladding extending partly onto the doors. Bodyside moldingsMoldings on the bodysides, to protect against door dings in parking lots. Moldings on the bodysides, to protect against door dings in parking lots. Mud guardsFlaps mounted behind two to four wheels, to protect the body from mud and rocks. Flaps mounted behind two to four wheels, to protect the body from mud and rocks. Panoramic sunroofFront glass panel retracts over a fixed glass roof panel. Entire unit covers nearly the entire roof. Front glass panel retracts over a fixed glass roof panel. Entire unit covers nearly the entire roof. Rear spoilerCan be small lip spoiler or a larger raised spoiler. Can be small lip spoiler or a larger raised spoiler. Special exterior trimOnly listed if not standard on all trims. No value because no way to compare across models. Wheel-lip moldingsExtensions to the wheel opening, both decorative and protective. Extensions to the wheel opening, both decorative and protective. Auto-dimming headlightsHigh beams automatically turned on and off. High beams automatically turned on and off. Auto-dimming rearview mirrorInterior rearview mirror automatically dims when hit by headlights of following vehicle. Interior rearview mirror automatically dims when hit by headlights of following vehicle. Automatic headlightsHeadlights automatically turn on and off. Includes value of automatic-off headlights. Headlights automatically turn on and off. Includes value of automatic-off headlights. Conversation mirrorEnables driver to view rear passenger compartment without turning around. Enables driver to view rear passenger compartment without turning around. Fog lightsLight wide area close in front of the vehicle. Light wide area close in front of the vehicle. Heated mirrorsClears ice and fog from mirrors. Clears ice and fog from mirrors. Illuminated visor mirror, driverIncludes value of non-illuminated vanity mirror. Includes value of non-illuminated vanity mirror. Illuminated visor mirror, passengerIncludes value of non-illuminated vanity mirror. Interior ambient lightingLEDs cast a soft glow over and/or highlight parts of the interior. LEDs cast a soft glow over and/or highlight parts of the interior. Large energy flow and fuel economy displayStandard or optional in some hybrid vehicles. Fancy display of power flows, enhanced trip computer information. Standard or optional in some hybrid vehicles. Fancy display of power flows, enhanced trip computer information. LED tail lightsOnly listed if not standard on all trims. No value because no way to compare across models. Map lightsFront row reading lights. Perimeter approach lightingArea around the vehicle is illuminated when the vehicle is remotely unlocked. Area around the vehicle is illuminated when the vehicle is remotely unlocked. Power mirrorsIncludes value of manual remote mirrors. Includes value of manual remote mirrors. Trip computerReports average fuel economy, and perhaps also instantaneous fuel economy, distance to empty, average speed, and other stats. Reports average fuel economy, and perhaps also instantaneous fuel economy, distance to empty, average speed, and other stats. Additional engine coolingNo value because no way to compare across models. No value because no way to compare across models. Automatic start / stopAutomatically cuts off the engine when the vehicle is stopped and restarts it when the driver lifts off the brake pedal. Not listed for hybrids, where it is generally part of the powertrain system. Automatically cuts off the engine when the vehicle is stopped and restarts it when the driver lifts off the brake pedal. Not listed for hybrids, where it is generally part of the powertrain system. Lockable center differentialThe center differential can be manually locked using a button. Only for use at low speeds on loose surfaces. Engaging low range (where available) usually locks the center differential automatically. The center differential can be manually locked using a button. Only for use at low speeds on loose surfaces. Engaging low range (where available) usually locks the center differential automatically. Oil coolerOnly listed if not standard on all trims. No value because no way to compare across models. Transmission coolerOnly listed when pricing a single model because insufficient data for all cars. Foldaway tray table, second rowErects between the seats; in vans stows against a seat to open up walk through; in sedans stows in a console. Erects between the seats; in vans stows against a seat to open up walk through; in sedans stows in a console. Folding second row seatsSeat folds to enlarge cargo area. Unless the seat is also removable, it usually folds flat or nearly flat. Seat folds to enlarge cargo area. Unless the seat is also removable, it usually folds flat or nearly flat. Folding third row seatsSeat folds to enlarge cargo area. Unless the seat is also removable, it usually folds flat or nearly flat. Leather seating surfacesSeating surfaces are trimmed in leather; other upholstery tends to be leatherette. Seating surfaces are trimmed in leather; other upholstery tends to be leatherette. Manual fore-aft adjuster, second row seatsSeat adjusts back and forth to vary the split between the second row and the third row or cargo area. Seat adjusts back and forth to vary the split between the second row and the third row or cargo area. Power lumbar adjuster, driver seatPower-adjustable lower back support. Power thigh support length adjuster, driver seatPower-adjustable cushion length; provides better support for long legs. Power-adjustable cushion length; provides better support for long legs. Power tilt adjuster, driver seatPower tilting seat cushion; can take the form of a second height adjustment. Power tilting seat cushion; can take the form of a second height adjustment. Special interior trimOnly listed if not standard on all trims. No value because no way to compare across models. Stain-resistant fabricFabric that resists stains, and in many cases odors as well. Fabric that resists stains, and in many cases odors as well. Chrome-clad alloy wheelsAlloy wheels with a chromed plastic veneer. Replace and include value of regular alloy wheels. Alloy wheels with a chromed plastic veneer. Replace and include value of regular alloy wheels. Machined alloy wheelsOuter surface of alloy wheels machines to yield a bright finish. Replace and include value of reqular alloy wheels. Outer surface of alloy wheels machines to yield a bright finish. Replace and include value of reqular alloy wheels. Sport suspension (upgrade)Only listed if not standard on all trims. No value because no way to compare across models. Wheel locksLug nuts that can only be removed using a special key. Prevents theft of wheels. Lug nuts that can only be removed using a special key. Prevents theft of wheels. 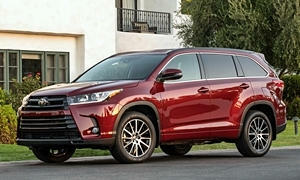 See TrueDelta's information for all Toyota models. None of our members have yet commented on the available features of the 2019 Toyota .